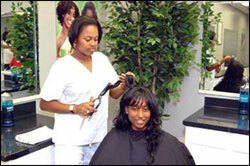 The Cosmetology program is designed to prepare the student to become a Louisiana State Licensed Cosmetologist. It is a ten (10) month 1500-clock hour program consisting of classroom lectures (theory), laboratory activities/clinical training (practical). Prospective matriculant must be 17 years or older, possess a high school diploma, or equivalent certification. To successfully complete this training program, the student must have a minimum overall GPA of 2.0 and complete 1500 clock hours in satisfactory progress and pass the State Board licensure examination. Upon completion, the graduate will be awarded a diploma in cosmetology. Students must pass the State Board licensure examination to receive a state license to practice cosmetology. Graduates from this program will possess vital career boosting skills in hair cutting, hair styling, manicuring, pedicuring, make up artistry, salon management and retailing.